Another Great Year in Kenya, Thanks to You! Our projects in Kenya made significant steps forward in 2017, despite being plagued by a health workers’ strike. And while the strike hampered our partners’ ability to deliver eye care services, it didn’t stop them! 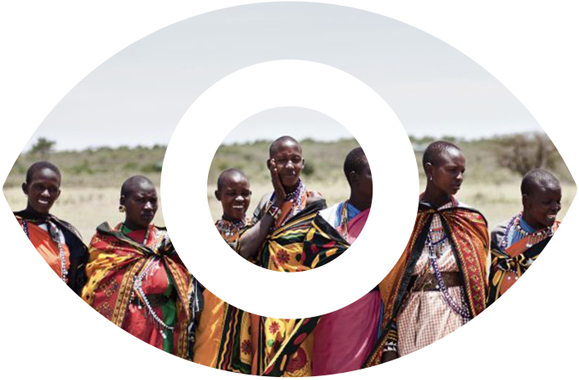 Moving full steam ahead, The Rift Valley Prevention of Blindness Project started its fourth and final year. Supported by our partner Standard Chartered Bank’s Seeing is Believing, our impact was strong. 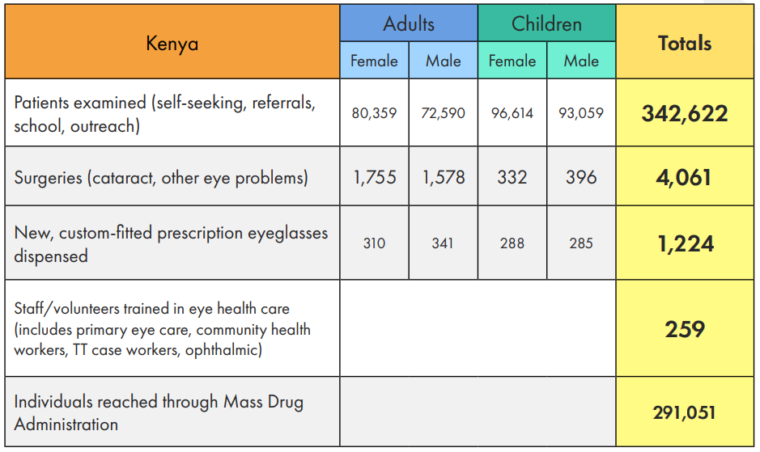 We’ve treated 60,706 people for various eye conditions so far. Our Kenya Trachoma Elimination Project, supported by our partner Queen Elizabeth Diamond Jubilee Trust was wildly successful last year. In fact, the active search for TT (trachomatous trichiasis) patients was halted mid-2017 because the number of patients with TT decreased. We’re making progress! This is partly due to our mass distributions of antibiotics. After another distribution, 2017 brought us within blinking distance of achieving our goal of less than one person with TT in a population of 1,000. An impact assessment will be conducted in 2018. 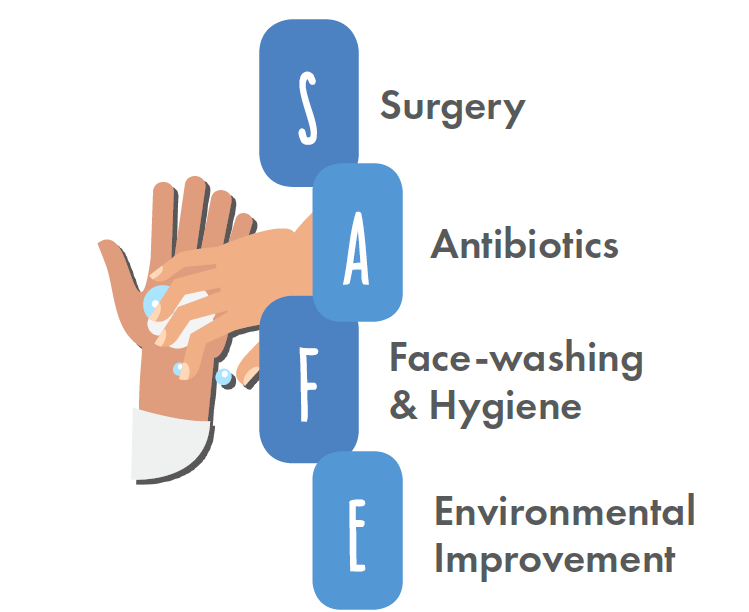 A World Health Organization strategy to educate people on improved sanitation habits that help reduce serious illness and trachoma (eye infection). The project is based in Narok County where active trachoma is high. In 2017 we introduced face washing and hygiene education into 15 schools. Each student received a face-washing kit. Our trained community health workers educated people in the villages where the schools are located on the importance of facial cleanliness and good hygiene. Particular focus was given to mothers of children under nine. In addition to facial cleanliness, we held open forums on environmental improvement. These forums encourage villagers to take responsibility for their community sanitation. Empowered through education, we saw various communities initiate the building of 101 latrines in 2017. With each latrine, washing stations are built at various points along the structures. Supported by Standard Chartered Bank’s Seeing is Believing initiative, mid2017 saw the start of our Kirinyaga Community Eye Health Project. 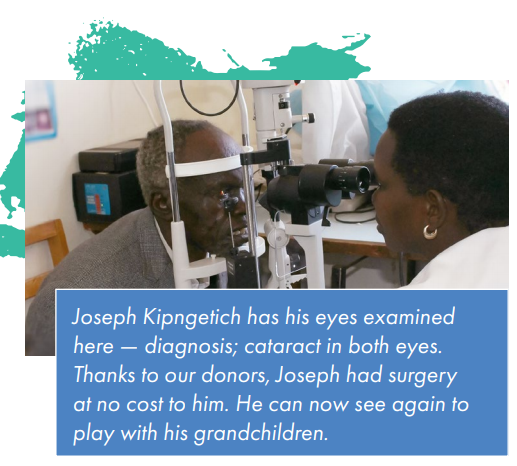 With our partner Kerugoya County Referral Hospital we targeted 150 villages to educate community members on the importance of eye health care. Thanks to our donors and partners, Kenya had a tremendous year.